Is there anyone else out there that wonders why it is that the Mother of the Bride is supposed to be dressed like a dowdy dowager? Why is it on the day that the bride is supposed to look her best, her mom has to look so, well--old? Mama Goodlaff is not the Queen Mum, and we both agree that her dressing as if this were true is out of the question. But, as you can see, the bridal industry generally thinks otherwise. "What did I ever do to you to make you hate me this much?" she asked. Mama Goodlaff printed the picture, carried it around in her wallet, and showed a lot of people her "mom-in-the-box" Mother of the Bride dress. But in all seriousness, Mama Goodlaff just wasn't finding dresses online and in magazines that fit what she was looking for. She just turned 50 (Hmmm, I hope she doesn't kill me for broadcasting that on the Internet...), and she certainly doesn't look it. She has a great sense of style and the typical bridal store's idea of what her outfit should look like would age her about 40 years. That just will not do, so this past weekend Mama Goodlaff and I set off in search for a Mother of the Bride dress that was not frumpy, ugly, or peach, and hopefully didn't cost an arm and a leg. Heeellllooo, Vanna! Alright, so this one wasn't technically a contender, but I figured that since Mama Goodlaff was trying on dresses, she could be my Barbie Doll for a few minutes. I pulled this one off the rack on a whim, and we both really liked the dress. "Are you sure you don't want a formal wedding?" she asked. Nice color, not a bad fit, but this dress just wasn't it. It smooshed her chest too much, and was more fun than elegant. The skirt twirled nicely, though! Mama Goodlaff tried on a few more, but one dress was the clear winner. Say hello to Mama Goodlaff's MOB dress! 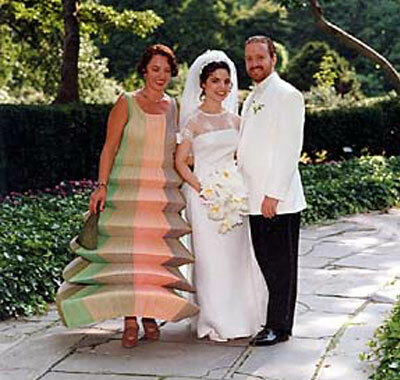 Both the color and the neckline were fabulous on her, and we both thought the dress was classy and elegant without being fussy, dowdy, or too dressy. The best part? She got a hell of a deal. The dress was 40% off, and Mama Goodlaff had a 15% off coupon, then got an additional %15 for using her store card. Total damage: $42 out the door. We ended up having to go to two different malls to find the right size, but in the end, it was totally worth it. And so it was that Mama Goodlaff ended up with the perfect dress right off the rack at a department store, and didn't have to compromise on style or pay out the nose for a great outfit (now she can spend more on shoes! Yay!). 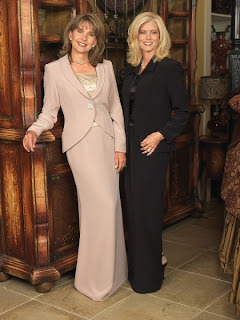 Did you help your mom shop for her Mother of the Bride dress? How was the shopping process, and what did she end up with? Did your mom find a dress that was the steal of the century? "And You Can Definitely Wear it Again!"